I recently came back from a work trip and with an almost bare refrigerator and my family away at the beach for a couple of days, the question of what to cook became a pressing question. 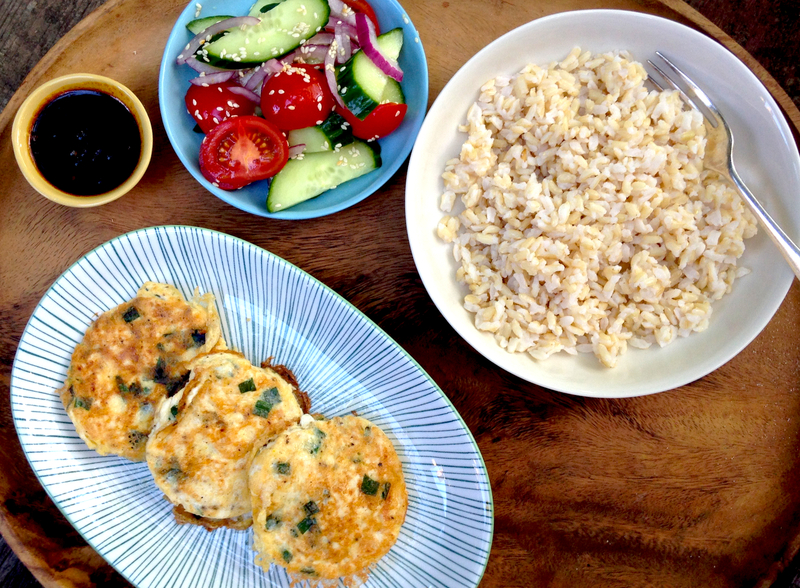 With no desire to schlep down to the shops, I cooked up a pot of brown rice and made do with the ingredients on hand – a packet of silken tofu, some eggs, and substituted some garlic chives from the garden for the spring onions in the omelettes. I’ve made these omelettes for years – I’ve never actually eaten them aside from the ones I’ve made at home, so I have no idea how authentic this version is. About a year ago, I planned to post this recipe and did a search to see if there were any other recipes out there, but most of them seem to fry the tofu before mixing with the eggs, which makes for a much heavier, oilier dish. This version makes a quick, light and much more wholesome meal. Best of all, by reducing the amounts in the recipe by two-thirds, it makes a simple delicious meal for one, which is good to know for those home-alone emergencies. light olive oil or vegetable oil for frying. Mash tofu roughly with a fork, stir in eggs, add spring onions and season with salt and pepper. Heat a large frying pan, lightly oil the pan and fry the mixture in small round omelettes. If you have egg rings, use them and you will have plumper, rounder omelettes, otherwise they will flatten out much more when frying. Cook omelettes three at a time and keep them warm until they are all cooked. Pour over the sauce, garnish with finely sliced spring onions if desired. I often use some Kecap Manis mixed with a little Siracha hot sauce instead of making the following sauce but if you have the ingredients on hand and can be bothered making it, this sauce it is really good. It can also be made ahead of time and reheated before serving. In a small saucepan, gently fry the onion and garlic until they are translucent and soft. Add tomato and cook for about 4 minutes, until tomato is cooked to a pulp. Add soy sauce, water and sugar bring to a boil. If making the sauce ahead, reheat before serving. This sounds lovely. I make an omelette for my little girl with tofu. It is so smooth and light. I think she might like this too. 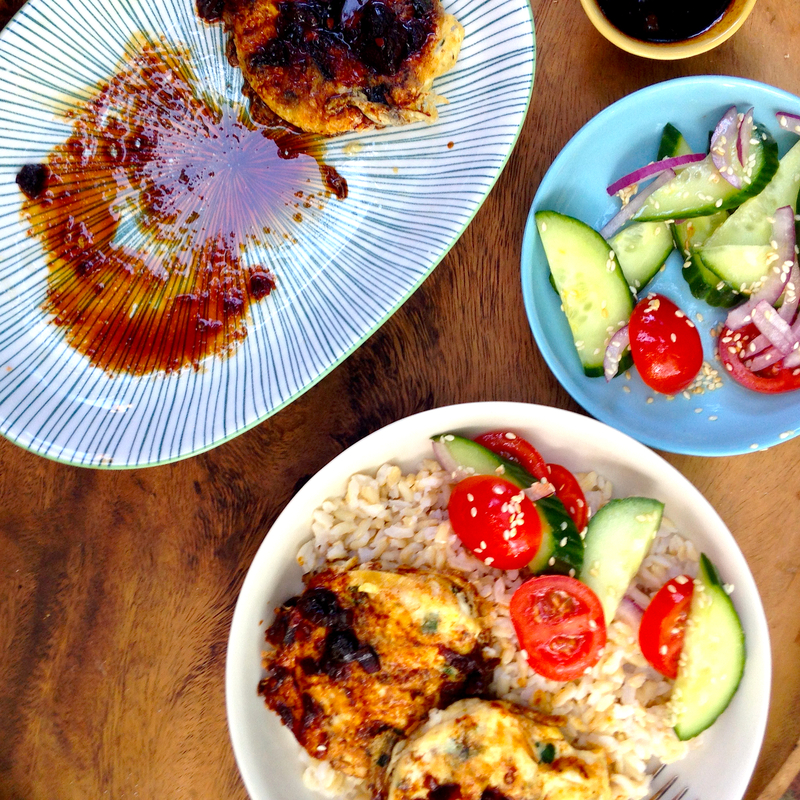 looks wonderful and is simple enough to make even if you are jetlagged and have no will to cook – will be bookmarking this one for sure!